WE ARE often told about the mistakes we are making with our diet and nutrition choices but less frequently are we given any real direction on what we should actually be eating in order to achieve the weight loss results we are looking for. Lunch is a classic example of this - we are told what to avoid and how much fat and / or calories popular lunch choices contain, but less often the specific details on what we should be packing and ordering. So if weight loss is your goal, here are some of the best lunch time options to help guarantee success. When we are wanting to lose weight we often go too hard too fast and grab a simple soup or salad and call it lunch. The issue with this is that while soup is a good choice, unless it contains a decent portion of meat, you will be hungry again an hour or two later. A much better option is a bowl of vegetable soup as well as a small sandwich or wrap. Not only will the vegetable bulk in the soup help to keep you full but the serve of carbs and protein via some egg, tuna or chicken on a sandwich or wrap will fill you for several hours. The key is to make sure the sandwich or wrap are small, not the jumbo size serves we generally have access to in food courts. A few leaves aren’t going to keep you full. But a balanced salad will. I am not talking about a few leaves and a tin of tuna here, rather 2-3 cups of salad ingredients along with a palm sized portion of protein such as chicken breast, lean lamb, salmon or a couple of eggs and a decent serve of carbs via a slice of wholegrain bread, ½ - 1 cup brown rice, sweet potato or beans. Most importantly, a serve of good fat from some olive oil dressing or 1/3 - ½ small avocado will again help to keep you full for several hours. 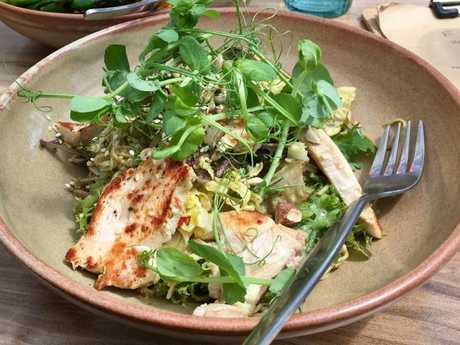 And remember that you are always better to make your own salad as food court options tend to be packed with extra fats and calories coming from cheese, nuts and lashings of dressing. 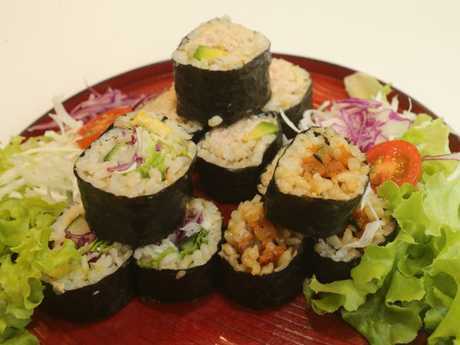 Now our go to with Japanese is generally sushi rolls and while they are relatively low in calories, they lack the protein and bulk to keep you full for 3-4 hours as a well-balanced lunch should. A much better mix is to include just 1-2 brown rice rolls, but load up with sashimi, Edamame and seaweed salad so you achieve a low calorie, high protein lunch that will satisfy you until late afternoon. The beauty with leftovers is not only that they are cost effective but you can completely control your calorie intake and as it is lunch you can also include a decent serve of carbs via rice, pasta or potato without impacting your weight loss attempts. You may have also noticed that enjoying a hot meal at lunch is much more satisfying than a comparatively unappealing salad or sandwich that you have been used to grabbing for years if not decades. Good options include stir fry with brown rice, a serve of pasta with tuna and salad or mini frittata muffins and salad. Chances are you have never thought about eating a potato for lunch let alone at work but if you consider that a single potato is a perfect portion of carbs; you can cook it in minutes in the microwave and then stuff it with your favourite protein - tuna, salmon, chicken or beans and top it with delicious sides such as avo, cheese, a little sour cream, chilli or mayo and serve with salad, a stuffed potato goes down as one of the cheapest and most filling lunches there is. Contrary to popular believe it is not a humble potato that makes us fat, rather its well-known cousin's hot chips and buttery potato mash that are linked to weight gain.